Jerricho Cotchery is a wide receiver for the New York Jets. He was drafted in the fourth round in the 2004 NFL Draft out of North Carolina State University. ◊ Played in 75 NFL games and has made 48 regular season starts. ◊ Registered 260 receptions for 3,260 yards and 13 touchdowns, 13 rushes for 75 yards, 22 kickoff returns for 577 yards with one touchdown, 23 punt returns for 182 yards and 29 special teams tackles...Also has scored two two-point conversions. ◊ Recorded back-to-back 82 reception seasons for the Jets in 2006 and 2007. ◊ Second Jets receiver in franchise history to record three consecutive seasons (2006-08) of 70-or-more receptions (Keyshawn Johnson, 1997-99) and the fourth in franchise history to record at least three seasons of 70-or-more receptions (Laveranues Coles- 2002, 05, 06, 08 and Al Toon- 1986, 88, 91 are the others). ◊ Caught at least one pass in his last 55 consecutive games played (streak started at CAR, 11/13/05). ◊ Streak of 15 consecutive games over two seasons of four-or more receptions, stopped in victory over PIT, 11/18/07. ◊ His 82 receptions in 2006 combined with Laveranues Coles (91) to form the best producing single-season receiving tandem in Jets history with 173 receptions. ◊ Posted seven regular season 100-yard performances in his career and one in postseason. ◊ Twice in 2007, caught two 40-yard-plus passes in same game- at TEN (12/23/07) and at BAL (9/16/07)-the latter he recorded a career-high 165 receiving yards on seven receptions. ◊ His 77-yard touchdown reception from Chad Pennington in the 2006 AFC Wild Card Playoff Game at NE, 1/7/07, is the longest offensive play in Jets postseason history. ◊ As a rookie in 2004, shared kickoff return duties with Jonathan Carter and LaMont Jordan, averaging 27.8 yards on 13 returns, including a 94-yard kickoff return for a touchdown in the 2004 season finale at STL, 1/2/05. ◊ Served as the Jets primary punt returner in 2005 with 7.8 yards per return on 23 returns. Led Jets with 71 receptions for 858 yards and recorded five touchdowns receiving (second on team)... Added a 54-yard kickoff return and two rushes for eight yards. SEASON HIGHLIGHTS: (12/28 vs. MIA)... Scored second career two-point conversion on a pass from Brett Favre. (12/21 at SEA)...Led all receivers with six receptions for 81 yards. (12/14 vs. BUF)...Caught an 11-yard touchdown pass. (11/13 at NE)...In the second quarter with the score 17-6, he had three receptions for 79 yards on a five-play touchdown drive...The drive started when Brett Favre hit him on an 18 yarder…Next, he pulled in a 46-yarder with one hand, against his helmet, while being interfered with, to get to the NE 16... Two plays later he hauled in a 15-yard touchdown catch by stretching the ball over the goal line. (11/2 at BUF)...Led all receivers for the second consecutive week with six catches for 62 yards… Named Jets Offensive Player of the Game. (10/26 vs. KC)... Led all receivers with nine receptions for a season-high 102 yards, his eighth-career 100-yard receiving game. (10/12 vs. CIN)...Tied for team lead with eight receptions for 85 yards. (9/28 vs. ARI)...Caught scoring passes of 17 yards and 40 yards. (9/22 at SD)...Led all receivers with a career high 10 receptions for 76 yards. (9/7 at MIA)...During theJets second possession of the game hooked up with Favre on a 56-yard touchdown pass with 8:42 remaining in the first quarter, the longest touchdown reception of the season for the Jets. Finished with 1,130 yards on 82 receptions and two touchdowns…Posted the 23rd 1,000-yard receiving season in franchise history, becoming the 12th player in franchise history to post more than 1,000 yards in a season…The 1,130 yards ties him for 13th-highest in Jets history with Art Powell (1962)…The 82 receptions ties him for ninth with his own 2006 effort. SEASON HIGHLIGHTS: (12/30 vs. KC)…Rushed once for a career-long 16 yards. (12/23 at TEN)…Caught eight passes for 152 yards and one touchdown…Pulled in 48- yard and 41-yard completions, marking the second time in 2007 he caught two passes of 40 plus yards in the same game. (10/21 at CIN)…Snagged his first touchdown reception of the season, a 32-yarder from Chad Pennington on the final play from scrimmage…Recorded one kickoff return for 32 yards. (9/30 at BUF)…Recorded his second 100-yard receiving game of the season and the fourth of his career with eight catches for 107 yards. (9/16 at BAL)…Logged seven catches for a career-high 165 yards, the most yards by a Jets receiver since Keyshawn Johnson vs. NE (9/12/99)…His 93 yards after the catch (YAC) marked the most since Johnson recorded 100 YAC in that same game…Caught passes from Kellen Clemens of 44 yards and 50 yards in the fourth quarter. Started every game and recorded a breakout season (82-961-6), with the ninth-highest total of receptions in a season. POSTSEASON: (1/6 at NE)…Became the 10th player in Jets’ postseason history to record a 100-yard receiving game, catching four passes for 100 yards and a touchdown in the Wild Card Playoff Game loss. His 77-yard touchdown catch-and-run from Chad Pennington was the longest offensive play in Jets’ postseason history. SEASON HIGHLIGHTS: (12/3 at GB)…Led the team with nine catches for 99 yards and added a 12-yard touchdown catch. (11/26 vs. HOU)… Registered seven catches for 110 yards, the second 100-yard receiving game of his career. (11/12 at NE)…Jets’ Offensive Player of the Week when he caught six passes for 70 yards, including a 22-yard touchdown. (9/17 vs. NE)…Set a career high with a memorable 71-yard touchdown reception where he jumped to haul in a Chad Pennington pass, absorbed a huge hit and landed on a defensive back…Knowing his knee had never touched the ground, he sprang to his feet and ran unimpeded to the end zone. (9/10 at TEN)…Hauled in his first career receiving touchdown in the season opener, an eight-yarder from Pennington. Served as the team’s primary punt returner, with 23 returns for 182 yards (7.8)…Caught 19 passes for 251 yards in a reserve role. (11/27 vs. NO)…Led the team with four receptions for 72 yards, including a 33-yard reception. (11/13 at CAR)…Made his first career start, lining up as part of a three-wide receiver set. 2004 (JETS) Recorded 13 kickoff returns for 362 yards (27.8) and a touchdown…caught six passes for 60 yards. POSTSEASON: Averaged 22.4 yards per kickoff return on eight returns in two playoff games. SEASON HIGHLIGHTS: (1/2 at STL)…Scored his first touchdown on a 94-yard kickoff return. (10/17 vs. SF)…Recorded his first career NFL catch for seven yards from Pennington to convert on third down on the Jets’ final drive of the first half. ◊ Broke NC State records with 200 career receptions and 15 career 100-yard receiving games, both previously held by Torry Holt (1995-98)...Finished second to Holt in school history with 3,119 yards and 21 touchdown catches. ◊ Tied for second in ACC history for 100-yard receiving games and ranks fourth in both career receptions and career receiving yards. ◊ Joined Florida State’s Peter Warrick as the only two receivers in ACC history to record 200 career receptions and 3,000 career receiving yards. ◊ His 86 receptions and 1,369 yards as a senior are both the second-highest in ACC and school history, topped only by Holt. ◊ Attended Phillips High (Birmingham, Ala.), where he played both ways as a senior, pulling down 39 catches for 1,008 yards and 13 touchdowns, offensively, and five interceptions and one touchdown, defensively. ◊ Four-year letterwinner in basketball as a shooting guard, competing against future Wolfpack teammate Philip Rivers and current teammate Kerry Rhodes. ◊ Majored in Sports Management at North Carolina State. ◊ The second-youngest of 13 children. ◊ Named the winner of the 2008 Ed Block Courage Award for the Jets. ◊ Honored by United Way of NYC as a Hometown Hero in 2007 season for his work off the field. ◊ Selected by the Jets staff as the 2007 Marty Lyons Award winner, given to the player who gives from the heart through charity and community involvement. ◊ Named the 2006 Kyle Clifton Good Guy Award, which recognizes consistent willingness, cooperation and professionalism in everyday dealings with the various departments in the organization. ◊ Hosts a one-day Annual Skills & Drills Football Clinic at Legions Field, Birmingham, Alabama with teammate and fellow Alabama native Kerry Rhodes each June. ◊ Honored by “Let’s Get Ready” for being a positive role model on and off the field. ◊ Hosts the Jerricho Cotchery Football Camp in New Jersey in July. 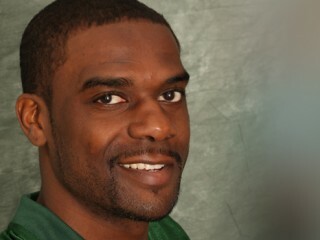 View the full website biography of Jerricho Cotchery.